'Yoda' (Barry Blyth, R. 2012) Seedling #S82-1. SDB, 12" (30 cm). Very early bloom. Standards honey-buff; falls light red-burgundy deepening to violet at center; beards lavender, outer 1/4" violet; slight musky fragrance. 'Lemoncello' X 'Killarney Green'. Tempo Two 2012/13. 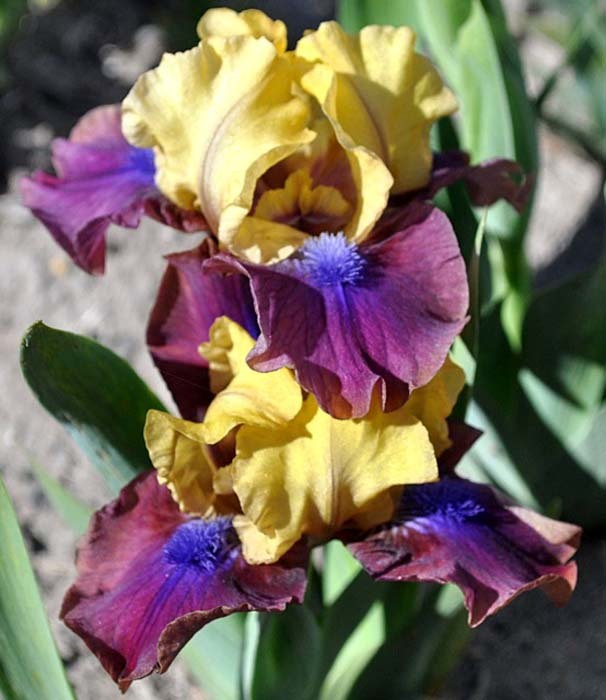 Hybridizer's comment: A lovely contrast with honey buff standards and falls of light red burgundy, deepening to violet at the centre. Beards are lavender and violet. Flowers here around 15 Sept.
Iris en Provence comment: reblooming in Hyères, France. jpg yoda-Hyeres.jpg manage 642 K 01 Apr 2017 - 10:14 Main.af.83 Photo by Iris en Provence , France (2017). jpg yoda2.jpg manage 449 K 21 Nov 2015 - 05:20 TasV 'Yoda', Tasmania, Australia, 2015.
jpg yoda3.jpg manage 225 K 21 Nov 2015 - 05:19 TasV 'Yoda', Tasmania, Australia, 2015.